It's easy to mistake the use of the Internet in learning as a simple way to make the same ol' same ol' seem a little more entertaining. What we're doing goes way beyond that. You now have the ability to use multiple media in ways that most effectively communicate your ideas and your sense of self. As you select from a rapidly expanding online toolbox, keep in mind that every tool we use has a form, a function, a capacity to be interpreted (and sometimes hacked) by users, and even a "DNA" instilled by its creators that influences the way it's perceived and adopted. Technology doesn't necessarily mean electronics. If you ask any serious writer, s/he will tell you that the action on a keyboard, the balance of a pen, or the texture of paper can make just as much difference as processing speed. And there are those times when nothing does the job like a simple, classic, well-made tool. 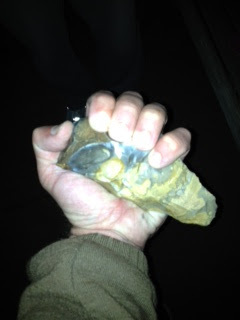 Here is a picture of me holding a 2 million year-old Acheulean Paleolithic bifacial hand axe-- the longest used tool in human history. It fit my hand perfectly, right down to the indentations for thumb and fingers, like it was custom-made for me-- an especially rare experience for a lefty. Apart from the perfect feel/form/function, there is something about an enduring classic that doesn't hold true for the phone you buy today that will be non-state-of-the-art in a few months. This is about more than craft, art, or even quality: this sort of attention to detail is the product of loving care. It's the difference between home-cooked and store-bought. For real practitioners of anything worthwhile, tools aren't just about techne, they are extensions of our humanity. Ask anyone who plays their music on a turntable, develops their own photographs, or sends handwritten letters.